The Suzuki TU250X. Photo courtesy of Suzuki Cycles. In a motorcycle market where motorcycles for the street are more specialized than ever, there is one category of motorcycle that is strangely under represented compared to, say, forty years ago. That category is motorcycles best suited to the beginning rider. When I started riding, there were many new and used street bikes in the 80-125cc and 150-250cc classes well suited to beginning riders. All of the big four Japanese manufacturers (Honda, Yamaha, Suzuki, and Kawasaki) offered such bikes new, as did several smaller Japanese and Italian makers. Triumph had their 200cc Cub and even Harley-Davidson, through their Aermacchi subsidiary, offered small displacement motorcycles for the beginning rider. In the 1960's and 1970's, 50cc to 125cc motorcycles were considered "small," the 150-250cc motorcycles were intermediate, the 350cc to 500cc motorcycles were midsize bikes and 600cc and larger motorcycles were "big" bikes. Today, a 250cc motorcycle is considered small and a 600cc motorcycle mid-size. Even a liter bike (1000cc) is no longer considered "big" in a world of 1250-2000cc heavyweight motorcycles. I have read articles in the motorcycle press about the Yamaha V-Star 1100's, calling them "middleweight" cruisers! This escalation toward bigger motorcycles has benefited older and more experienced riders, who now make up the largest share of the market, but it has left the beginning rider seeking to purchase his or her first motorcycle with fewer and fewer choices. An illustration of the problem is that the lightest weight and smallest displacement motorcycle Harley-Davidson makes in 2014 is the (approximately) 550 pound, 883cc Sportster. It is purchased by many entry level riders. When I started riding, the 883cc Sportster was the hottest motorcycle you could buy, the ultimate ride for the experienced rider. This illustrates how skewed the market has become. While there are many faster and more powerful motorcycles today, I assure you that an inexperienced rider can get into big trouble very quickly on an 883 Sportster. Recommending 600cc and larger bikes to beginners is like sending children out to play on the freeway and the results are both predictable and (often) tragic. There are still motorcycles that are suitable for the beginning rider and I am going to take a look at some of them in this article. Cruisers and standards are usually a better choice for the beginning rider than sport bikes. Modern sport bikes do what they do extremely well (which is go around corners--or a racetrack--at high speed), but they are often not good for much else. Cruisers and standards are more versatile, at home on city streets, country lanes and the interstate. They are suitable for commuting, weekend rides, the occasional longer trip, are generally easier to maneuver at low speed (where a tip-over is most likely) and are a little less likely to encourage overly aggressive riding. The worst choice for a beginner learning to ride on the street is a dual-sport or enduro bike. These off road, but street legal machines compromise handling, braking and safety due to their tall and skinny wheels, off road tires, short wheelbase and tall suspension. The excessive ground clearance (for paved roads) means a higher center of gravity, when a lower CG is better in every way on the street. Taken together, these compromises make dual purpose motorcycles more dangerous when ridden on the street than a real street bike. Beginners should choose the safest bike available. Low maintenance shaft or belt drives are advantageous on any motorcycle. Cast aluminum wheels, tubeless tires, triple disc brakes and self-adjusting valves are other worthwhile features found on some of the motorcycles discussed below. Self-canceling turn signals and anti-lock braking systems (ABS) are important safety features that should be standard on all street bikes; unfortunately, neither is offered on most entry level motorcycles. My opinion is that small to medium displacement (125-300cc) motorcycles are most appropriate for new riders. They are generally lighter and easier to maneuver, easier to balance, cheaper to repair if damaged in a spill and less likely to get the beginning rider into trouble. It might be worthwhile to pay attention to the seat height figures given for the motorcycles below, as it is reassuring for most inexperienced (and also experienced) riders to be able to put both feet on the ground when stopped. Light weight is an advantage, as is a low center of gravity, particularly for low speed maneuvering. Unless otherwise noted, all of the motorcycle specifications used in this article were taken from the Cycle World Buyer's Guide or the manufacturers' websites. More detailed specifications on many bikes are available on the various Motorcycles and Riding Online Comparison Charts. The motorcycles specifically mentioned below are examples of suitable motorcycles in various displacement classes. They are not the only possible choices, so if you find a similar machine from a major manufacturer that is not mentioned below, it is also probably a satisfactory first motorcycle. The motorcycles listed in the displacement categories that follow should be reasonably available on the used market and your first motorcycle should definitely be a used bike, unless you simply have money to burn. Your first bike is how you learn to ride, it is NOT supposed to be your dream bike or your ultimate ride. Virtually no one, despite their best intensions, keeps their first motorcycle more than a year or two, so it might as well be purchased used to minimize the cost of later trading it for something else. Since you are buying used and recognized brands are both more plentiful on the used market and retain their resale value better than obscure brands, stick with the major manufacturers. Harley-Davidson, Honda, Kawasaki, Suzuki and Yamaha are names recognized around the world and their bikes are very reliable. You don't want some third world machine that is liable to break down unexpectedly and for which parts are not readily available and widely distributed. A beginning pilot would not expect to learn to fly in an F-16 fighter or a wide body jetliner, so why do beginning motorcyclists expect to learn to ride on a 600cc sport bike or a heavyweight cruiser? Ideally, I would like to see beginning riders buy a standard 125cc motorcycle for their first street bike. There is a reason that many Motorcycle Safety Foundation courses maintain their aging fleets of 125cc Hondas for their entry level classes. These bikes are especially well suited to beginning riders of smaller than average stature, limited upper body strength, or limited confidence in their ability to master this new activity. Even very experienced riders find use for a small bike. One good friend of mine owns (at last count) seven motorcycles, including a couple of Harleys and a couple of hot sport bikes, but his daily "in town" ride remains a 30 year old Honda 90 trail bike. A 125cc street bike can accelerate briskly off the line, is fast enough to keep up with city traffic, will cruise at 55 mph and handles like a "real" motorcycle, not a scooter or a trail bike. If it falls onto its side, most riders can right it without assistance. In military aviation terms, a 125 makes an ideal primary trainer. Of course, few riders will be satisfied with a 125cc machine in the long run. However, for the new motorcyclist's first (and most dangerous) year, one of these lightweight machines will make a fine commuter and primary trainer. No matter what motorcycle a new rider buys first, within a year or two he or she will want to try something different. Most riders own several motorcycles before they find the bike they like best. Burn those last two sentences into your brain. Your first motorcycle is a trainer, not a "keeper," no matter what you buy! Unfortunately, Harley-Davidson, Victory, BMW and Triumph offer nothing in this class. The discontinued Honda CB 125S was just about the perfect first motorcycle. The CB 125S was produced for many years. A friend of mine used to let me ride hers, which was a late 1970's model. This lightweight standard looked and handled like a real motorcycle, which it was. It was powered by a 124cc, SOHC, four-stroke single cylinder engine and the final drive was by chain. The wheels were laced. Stopping power was provided by a front disc and rear drum brakes. There was even a helmet lock. Top speed was about 67 mph. The last year I can find it catalogued in the Motorcycle Price Guide was 1984. That year it cost $898 brand new. Unfortunately, only Kawasaki (with their Kawasaki Eliminator cruiser) among the Japanese "Big Four" has recently imported a 125cc street bike into the U.S., although it is no longer available. (It is no secret that the big profits are in big bikes.) The Eliminator's decent suspension allows it to handle and corner well. It is powered by a 124cc air cooled, single cylinder motor. There is a 5 speed transmission and chain final drive. The brakes consist of a disc in front and drum for the rear. The seat height is 26.8 inches and the dry weight is 290 pounds. Top speed is about 60-65 MPH. The gas tank holds 3.4 gallons, enough to go a long way on this economical motorcycle. With the general demise of new motorcycles displacing less that 250cc (15 cubic inches), a 250 is now considered a small motorcycle. Ideally, a 250cc class motorcycle is what the rider who has learned primary riding skills on a 125 should move up to. In military aviation terms, a 250 is your basic trainer. For most riders in North America, a 250-300cc machine may be the smallest displacement motorcycle they can find and it will serve as their first motorcycle. A 250-300cc bike is a versatile machine, fairly powerful, moderate in weight, acceptably fast. If necessary, it can cruise on the freeway at 65 mph for reasonable periods of time. A 250 is not a touring bike, although I once rode a standard 250cc motorcycle from Tillamook, Oregon to Los Angeles, California (a round trip of about 2,000 miles). Neither is it a good choice for riding double, but a beginning rider should not be carrying a passenger in any case. A person can get into a lot of trouble on a 250, but for the beginning rider of average size, strength and confidence it can be an excellent trainer. A 250 standard or cruiser type street motorcycle is an ideal commuter bike for any rider, regardless of experience. It is fast enough to stay out of trouble and easy to handle and park. Note that sport bikes generally have restricted steering, lock to lock, compared to standard and cruiser types and are therefore more difficult to maneuver and park. The major American and European makers have not offered any street bikes in this class for a long time, but the Japanese have. There are the Kawasaki Ninja 250/300 and Honda CBR250 and 300 sport bikes. 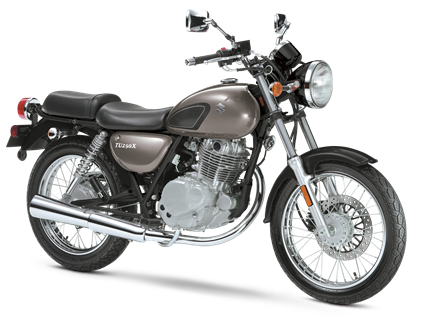 There are good numbers of Honda Nighthawk 250 standard and CMX250C Rebel cruisers available. Suzuki is represented by the GZ250 cruiser and TU250X standard. From Yamaha comes the sharp looking V-Star 250 cruiser. All of these 250-300cc machines have four-stroke motors and all rely on conventional telescopic front forks and chain final drive. The average weight of these bikes is about 300 pounds. All are available in reasonable numbers and at reasonable prices on the used market. For the aspiring sport bike rider, the Kawasaki Ninja 300 (formerly the Ninja 250) has been around for years, but in 300cc form it has been substantially upgraded. It has a Digital Fuel Injection, liquid cooled, DOHC, inline twin engine and a six-speed transmission with FCC slipper clutch. The rear suspension is provided by a mono-shock. It also comes with lightweight cast wheels, disc brakes front and rear and a full sport fairing. The gas tank holds a whopping 4.5 gallons. ABS is available at extra cost. The top of the line Ninja 300 ABS SE's curb weight is 388 pounds. It is fast and handles very well, with a top speed of about 100 mph. It's 29.3 inch seat height and sport bike ergonomics will be drawbacks for many beginning riders, but its conventional handlebars and footpegs make it easier and more comfortable to ride than most sport bikes. Overall, it's a sophisticated and neat machine. Honda's sport bike offering is the very sophisticated CBR300, formerly a 250 (CBR250) whose displacement has been increased to 300cc for 2014. This is a single cylinder, DOHC, counterbalanced, sport bike with serious features. Included is a 6-speed transmission, EFI, electronic ignition, analog and digital instruments, mono rear shock, radial tires, 3.4 gallon gas tank and 77 MPG. The disc brakes front and rear can be controlled by an optional, combined ABS system. If you are looking for a high-tech Honda sport bike, here you are. Suzuki's TU250X, introduced in 2012, is a standard style, single cylinder 250. The basic motor and brakes are shared with the GZ250 cruiser. Seat height is 30.3", ground clearance is a useful 6.5" and the gas tank holds 3.2 gallons. EFI and electronic ignition are featured, along with an estimated 79 MPG. There is a photo of the TU250X at the top of this article. If you are looking for a late model 250, give this Suzuki serious consideration. The discontinued Honda Nighthawk 250 was an attractive and practical standard. Its 234cc SOHC parallel-twin engine and 5-speed transmission gives it adequate performance. Its laced wheels and drum brakes front and rear should make it economical, but its list price was actually somewhat higher than the other 250's, $100 more than the Virago and $400 more than the Ninja. The gas tank holds 4.3 gallons, enough to go a long way on a 250. The Nighthawk's seat height is the same as the Ninja's and taller than the other 250's, at 29.3 inches. It weighs 287 pounds. The best selling motorcycles today are cruisers, which explains why there are three recent cruisers in the 250cc class. The Honda Rebel is that company's entry. The same engine and transmission that powers the Nighthawk powers this mini cruiser. Strangely, the Rebel cruiser has a shorter wheelbase than the standard Nighthawk, but weighs in 19 pounds heavier (at 306). It gets a disc brake in front, which is a real improvement, and laced wheels. Fuel capacity is 2.6 gallons. The seat height is only 26.6 inches and the center of gravity is lower than the Nighthawk's. The Suzuki GZ250's 249cc SOHC single cylinder motor gives it a reported top speed of 76 mph; I would expect a little more horsepower from the Honda 234cc inline twins and the Yamaha 249cc V-twin. However, there is no denying that singles are fun. A disc in front and a drum in back provide braking and the wheels are laced. The GZ250 cruiser weighs 301 pounds and has a generous 3.7 gallon gas tank. Seat height is a low 27.8 inches, but the ground clearance is a bit limited at 4.9". To my eyes, the Yamaha V-Star 250 is the best looking 250 cruiser. The overall visual impression is of a true middleweight motorcycle. Its 60 degree, 249cc, SOHC V-twin motor and five speed transmission provides adequate thrust and a little more character than inline twins. A V-twin usually has a lower center of gravity than does a vertical twin. The Yamaha comes with laced wheels and a disc brake in front; like the other cruisers, it has a rear drum brake. The V-Star's gas tank holds 2.4 gallons and the bike weighs a portly 323 pounds (wet). The seat height is 27 inches. Claimed fuel economy is 78 MPG. 500cc (30 cubic inch) bikes are the next logical step up in displacement from the 250's. To again put it in military aviation terms, a 500 is analogous to an advanced trainer. A 500cc street bike used to be a large middleweight motorcycle. Marlon Brando rode a 500cc Triumph Speed Twin in the seminal outlaw motorcycle movie The Wild Ones, which was inspired by the Hollister incident back in the 1950's. Not many outlaws today ride sweet 500cc twins! Once the most competitive class in sporting street bikes (much as the 600/650cc class is today), the 500cc class seems to be an endangered species. Nevertheless, there is a reasonable selection of used bikes available. The typical 500 has most of the same advantages possessed by the 250's, only more so. A 500cc bike offers more of everything compared to a 250, including greater weight. The adult beginning rider of average or larger than average size, strength, and confidence will be well served by a 500cc machine, as long as he or she has a considerable amount of self-control. The average weight of the 500's discussed below is 388 pounds, 88 pounds more than our average 250-300cc bike. A 500cc bike is fast enough to run with the big boys, although it will be working harder at any given speed than a 600cc or larger displacement motorcycle. This is very attractive to most prospective buyers, but bear in mind that a beginner can also get into trouble more quickly than he or she would on a 250/300. Until 2001, 500cc was the maximum displacement allowed in Gran Prix racing. While a 500 can be among the most versatile of motorcycles for the solo street rider, it can also be a very high performance motorcycle! A typical 500cc street bike probably has a top speed of around 100 mph and can cruise for extended periods of time above the legal speed limit on the highway. It is light enough to be a good commuter bike in the city and relatively easy to park. Most 500's have enough acceleration to blow away all but the quickest cars in an impromptu "stoplight Grand Prix." 500's traditionally have the handling and brakes to back up their acceleration and speed, if the rider has the experience, self-control and judgment to use them properly. 500cc class bikes from Buell, Kawasaki, Suzuki and Yamaha are available on the used market. The new Harley-Davidson Street 500 (a sweet V-twin) is available in Europe and Asia for 2014 and may, or may not, be marketed in the U.S. later in the year. (As this is written in May 2014, the Street 750 is due for a mid-2014 U.S. introduction and the availability of the Street 500 in North America is unclear.) Royal Enfield (now made in India--formerly of the UK) still offers new 350cc and 500cc street bikes. The major European manufacturers have not offered entry level 500cc street bikes for a long time, which is a pity. The discontinued Kawasaki Vulcan 500 LTD is a typically styled middleweight cruiser. It shares the same basic 498cc DOHC inline twin as the Kawasaki 500cc sport bike, but the Vulcan's motor is tuned for more midrange torque and less high RPM horsepower. The transmission has six-speeds. Fuel/air mixture gets to the engine through two 32mm carburetors. The frame is a conventional mild steel cradle. Suspension duties are handled by telescopic front forks and twin rear shocks. The wheels are laced, and the brakes consist of a disc in front and a drum in back. The Vulcan 500 has a teardrop shaped gas tank that holds 4 gallons of gas and a tank mounted speedometer. Seat height is 28.1 inches. Claimed dry weight is 439 pounds. Vulcan's are competitively priced on the used market. For many years, Suzuki offered their now discontinued Suzuki GS500E sport-standard. It is powered by a 487cc DOHC inline twin fed by two 33mm carburetors. There is a six-speed transmission and chain final drive. The frame is a perimeter type and conventional telescopic forks and a rear mono-shock handle suspension duties. Disc brakes front and rear stop the three spoke cast aluminum wheels and tubeless tires. The gas tank holds 4 gallons. Seat height is a tall 31.1 inches. Claimed dry weight is 372 pounds and the wheelbase is 55.5 inches. The Suzuki GS500E was one of the best equipped bikes in the class and it is usually quite reasonably priced on the used market. Yamaha's Virago 535 cruiser, discontinued after the 2001 model year, is more radical looking than the Kawasaki Vulcan 500. A smooth 70-degree SOHC V-twin engine that displaces 535cc powers the chopper-esque Virago. This engine is fed by two 34mm carburetors. Power reaches the rear wheel through a five-speed transmission and shaft final drive, the only shaft drive in the 500cc class, a big plus. The backbone type frame uses the engine as a stressed member. The raked front forks share suspension chores with dual rear shocks. A disc brake in front and a drum brake in the rear stop the laced wheels. Self-canceling turn signals are both a convenience and a safety feature. Dual shorty slash cut mufflers enhance the chopper image. The 28.3 inch seat height allows most riders to reach the ground with both feet. The 401 pound dry weight is average for the class and the low center of gravity makes low speed maneuvers less stressful. All of this sophistication and style once put the Virago 535 at the top of the 500cc cruiser class. It remains one of the best beginner bikes in the class and is still seen on the used market. The question here becomes whether these powerful machines are ever good first bikes, and if so, under what circumstances? To use my military aviation analogy for the last time, starting with one of these machines is like trying to learn to fly in a combat aircraft. The most typical accident for the beginner on a new 600cc sport bike is caused by a loss of control the very first time the bike is ridden, usually within five miles of the dealership from which he or she bought the bike. This is not an encouraging statistic. These are not machines for the youthful or immature rider. The lure of power and speed represented by such machines will almost certainly overcome the self-control and limited skill of such riders, often with tragic results. If you are not over forty, and mature, do yourself and your loved ones a favor and learn on a lighter, easier to control, less powerful motorcycle. A 600-650cc machine (650cc equals 40 cubic inches) does give the heavy rider, the new street rider who has extensive experience on dirt bikes, or the person who anticipates eventually doing a lot of two-up riding (couples, for instance), a more powerful alternative to the bikes previously discussed. Motorcycles of this size will generally be heavier and more difficult to maneuver at low speed. They can be a handful in conditions of reduced traction (like gravel or dirt roads). They will cruise at high speeds for extended periods of time and can be used for touring with appropriate accessories. Because they generally cost more either new or used than the bikes previously discussed, they may have more features and more accessories may be available. The dry weight of the bikes profiled below varies from 350 to 495 pounds, averaging 423 pounds. Even more powerful 750cc and larger motorcycles are, in my opinion, suitable for very few beginning riders. I regard them as beyond the scope of this article. They may be suitable for adult riders returning to the sport after a long layoff, but such riders are not first time buyers and usually have a good idea of what sort of bike they want. I will mention a few 600-650cc class motorcycles with this warning: FOR MATURE ADULTS ONLY! The 600cc class Honda Shadow VLX represents that company's middleweight cruiser. It is the smallest bike in this group in displacement. There is a standard model and a somewhat spiffier Deluxe model. The latter has chromed cases and cylinder heads and two-tone paint. The VLX is powered by a 583cc SOHC V-twin engine, which delivers its power though a five-speed transmission and chain final drive. The wheels are laced. The front brake is a disc and the rear brake is a drum. The gas tank holds only 2.9 gallons. The height of the comfortable seat is a low 25.6 inches, excellent for those of short stature. Wheelbase is 63.2 inches. Dry weight is given as 445 pounds. The VLX is handsome and practical, but not lavishly equipped. As with most Honda models, it is well represented on the used market. The Yamaha V-Star 650 is available in two models. There is the more aggressive looking V-Star Custom and the more retro appearing V-Star Classic. Both are well appointed and handsome bikes. These are large machines for middleweights and they share the following specifications. Power comes from an air-cooled SOHC V-twin displacing 649cc. There is a smooth five-speed transmission. The wheelbase of both is 64 inches. Both are built on the same Softail-looking frame with concealed rear shocks. The fuel capacity of the attractive teardrop tank is 4.3 gallons, with the instruments mounted on top a-la H-D. The front brakes are discs and the rear brakes are drums. The wheels are laced and the back tire is wide. Features of both include chrome engine/transmission cases and cylinder heads, shaft final drive and self-canceling turn signals. However, there are significant differences between the two. The Classic, particularly, looks like a heavyweight motorcycle. The Classic's chrome headlight is larger, the seat is thicker and the fenders are longer and wider than the Custom's. The front forks are fully shrouded by chrome covers and the laced front wheel is fatter and smaller in diameter. Seat height is 28 inches. Dry weight of the Classic is a portly 495 pounds, very heavy for a 650 and especially a 650 ridden by an inexperienced rider. The Custom is, to my eyes, the most attractive of the middleweight cruisers. It looks a lot like a chromed-out Harley Softail Standard. The dry weight of the Custom is 460 pounds, so it is also a heavy 650. It features a slim "cycle" style front fender and a bobbed rear fender. The laced front wheel is larger in diameter, narrower and held between conventional (un-shrouded) forks. The seat is thinner and lower; seat height is only 25.6 inches. The principle drawback to these excellent V-Stars from the beginner's standpoint is their considerable weight. Both models sold well and are available at reasonable prices on the used market. The Suzuki Savage 650 is an unusual midsize cruiser in that it is powered by an air-cooled, SOHC, 652cc single-cylinder engine, rather than a twin. This big thumper is very light in weight, at only 350 pounds dry. The wheelbase is 58.3 inches. This is a true 650 at a 500's size, weight and price. The seat height is a reasonable 27.6 inches and there is plenty of steering lock for maneuvering in tight spaces. The low seat height and general ergonomics are good for smaller riders, with a short reach to the handlebars. The belt final drive should be virtually maintenance free. Other specifications are more mundane. The transmission has five speeds, the slender gas tank holds only 2.8 gallons, suspension is by telescopic forks in front and conventional dual shocks in back, the wheels are laced and the brakes consist of a single disc in front and a drum in the back. The Savage comes with a low sissy bar and passenger backrest, buckhorn handlebars and a bobbed rear fender. These are features that many riders purchase as accessories for other bikes. The Savage 650 is clearly one of the best buys on the used market. Suzuki's Boulevard S40 (40 cubic inches, get it?) is a cruiser style machine built around Suzuki's vertical, single cylinder, 652cc motor. (Thank goodness for electric starting!) Fuel is delivered by a carburetor, while the ignition is electronic. The seat height is 27.6", ground clearance is 5.3" and the curb weight is 381 pounds. Fuel capacity is 2.8 gallons and the mileage rating is 63 MPG. Like the discontinued Savage, final drive is by belt. The S40 is a good looking bike with improved ergonomics and is undoubtedly fun to ride. The late, lamented Kawasaki W650 was a different kind of retro bike, a standard easy to mistake for a late 1960's Triumph Bonneville. Kawasaki claimed that the W650 was inspired by their own 1960's vintage W1 twin (itself a knockoff of a pre-unit construction BSA 650), but anyone who has seen a W1 knows the W650 looks nothing like that and very much like the vastly more popular Bonneville. The tank, tank badges, rubber knee pads, rubber fork gaiters, cases, exhaust system, seat, fenders, headlight and paint job all reek of Triumph influence. This is not bad thing, as the 1968-1970 Triumph Bonnevilles are widely regarded as some of the most beautiful motorcycles ever built. Whatever its heritage, the W650 was a versatile all-around motorcycle and one of my personal favorites. It is not a typical first bike. It is more likely to be purchased by a canny old pro than an inexperienced beginner. It is the kind of bike discriminating riders settle down with after owning several previous machines. The W650 offered classic styling and modern reliability, without oil leaks. It was powered by an air-cooled vertical twin with a 360-degree crankshaft, again like a classic Triumph. However, this Kawasaki twin had a SOHC and displaced 676cc. The slick shifting transmission had five speeds and final drive was by chain. There was a kick starter, as well as electric starting. The gas tank held 4 gallons. A stock W650 weighed 430 pounds, quite a bit more than a 650 Bonneville's 386 pounds. That included the weight of a front disc brake, although the rear still had to make do with a drum brake. The W650's seat height was 31.5 inches, but the bike was narrow, which helped the rider's feet reach the ground. The W650 is not a particularly cheap used 650, as it is highly desirable on the used market. However, it is an easy to ride, good handling, well equipped motorcycle and one of the top choices for a rider returning to motorcycling after a long lay-off. Copyright 2000, 2016 by Chuck Hawks. All rights reserved.